Fixed Cut Price Skoda Octavia. Only £10,995. Škoda’s Octavia hatchback is now being offered at an incredible £10,995 on the road or from just £149 per month with Skoda Finance. This outstanding offer applies to 1.6 MPI SE specification cars and represents a saving of £3,735 (25%) off the normal price. 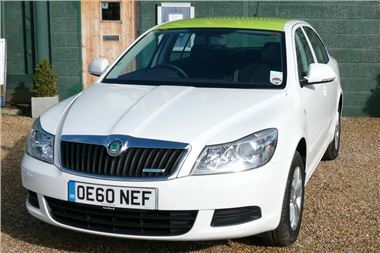 Since this is a Skoda price rather than a dealer discount, the basis of BIK for company car tax should also be just £10,995. A generous standard equipment list extends to 15” alloys wheels, ABS, airbags, air conditioning, front and rear electric windows, a touch screen stereo with six-CD changer, trip computer and electric heated door mirrors. The 1.6 MPI (102 PS) engine offers excellent performance and low running costs which, combined with Škoda’s engineering excellence, represent the outstanding value for money for which the brand has become famous. The Octavia already has a reputation as a great family car thanks to its combination of style, reliability, comfort and class-leading interior space. But don’t just take our word for it – the Octavia was recently awarded by What Car? readers as the Best Small Family Car. Škoda also picked up the award for Best Manufacturer, and came out top in the Auto Express Driver Power Awards. This offer is limited to 2,000 cars nationwide and is available to order from retailers now.